The Shellter family is a family introduced in Hey! Pikmin. The only member of the family so far is the Crammed Wraith. 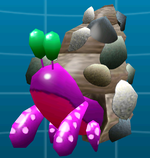 The Crammed Wraith is a hermit crab-like enemy found in Hey! Pikmin. When it notices Pikmin approach, it will push them away. This page was last edited on February 17, 2019, at 12:54.